Turkey vs Greece: Is war a real possibility? Tensions have escalated between Greece and Turkey in recent months over territorial disputes in the Aegean, with a collision between a Turkish cargo ship and a Greek war ship on 4 May prompting a nervous response from some observers. Thimios Tzallas writes that although there are incentives for Greek and Turkish politicians to give the impression they are playing with fire in the Aegean, both are likely to retreat from full conflict. However, it may take until after the Turkish general election in June for tensions to decrease. There are two ways to read the Greek-Turkish dispute that has escalated in recent weeks in the Aegean, prompting some to even talk about a possible military confrontation. One is that advanced by the two sides involved: the maritime boundaries between the two countries is an issue of strategic significance and prestige for both. The second is that advanced by Bill Clinton. In 1996 the former US President handled the last serious incident between the two countries. Then, Greece and Turkey came to the verge of a naval confrontation over sovereignty of an islet (Imia according to the Greeks, Kardak according to the Turks). In his biography, Clinton recounts how his administration managed to prevent the two NATO allies from going to war over “a cluster of rocks inhabited by half a dozen sheep”. “I couldn’t help laughing to myself at the thought that whether or not I succeeded in making peace in the Middle East, Bosnia, or Northern Ireland, at least I had saved some Aegean sheep” recounts Clinton. The American intervention defused the situation via diplomacy in the time-honoured Balkan way: an intermediate deal. The same as Dayton in 1995, Resolution 1244 for Kosovo in 1999 or Ohrid in 2001. The modus vivendi in the Aegean relieved the tension, but shifted the problem to the future. 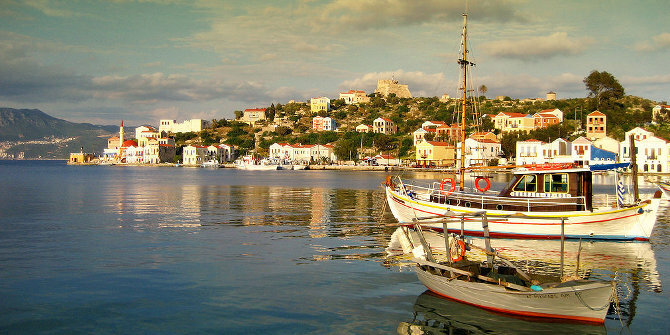 In the Aegean there are some 7,500 islands and islets. Their status was decided by treaties after the two World Wars. Clinton is right. Greece had acquired Imia in a treaty with Italy in 1947, but the islets are in the middle of nowhere, and hardly anyone in the two countries, excepting a handful of shepherds and diplomats, knew they even existed. The rocks there are useful for raising flags, which the two sides are in the habit of doing in order to provoke each other and address the emotions of their domestic audience. This is exactly what is happening now in the Aegean. Flags are raised and lowered to declare national sovereignty, fighter jets violate national air space, incidents between coast guard vessels are played out. Concurrently, the politicians make dramatic statements for internal consumption in the two countries. The President of Turkey, Recep Tayyip Erdoğan, has called for snap elections on 24 June, and in a blatantly artificial way has suddenly raised the ante, stating recently that “their [the Greeks’] tricks only last until they see our aircraft, our army and our navy”. Things are no better in Greece. In the context of the coalition government between the radical left and nationalist right, the Defence Ministry is directed by two politicians fond of conspiracy theories: The hawkish right-wing Defence Minister Panos Kammenos, and his deputy Fotis Kouvelis, a long-time politician of the left. Both have at different times submitted questions in parliament about whether the Greek people are being sprayed from aeroplanes with substances that make them more receptive to the dictates of foreign decision centres. Both have described what is happening in the Aegean as an “undeclared war”. The Greek Prime Minister is much more careful. He has limited himself to a symbolic visit to Kastellorizo. It is the second time in recent years that Greeks have seen their Prime Minister on this remote border island that lies just 1.25 nautical miles from the south-western coast of Turkey. In 2011, former Prime Minister George Papandreou also chose Kastellorizo to announce the entry of Greece into the Memorandum. Concurrently with the incidents in the Aegean, the two countries also confront each other on the diplomatic field. After the failed coup in Turkey, Greece has become the second most preferred European destination for anti-government Turks seeking asylum. The best-known case is that of eight Turkish officers whom Erdoğan accuses of having participated in the coup and whom the Greek courts have refused to extradite to Turkey. Indeed, one of them was just released from custody. In reprisal, Turkey arrested two Greek soldiers at the Evros border. Formerly, such incidents of Greek or Turkish soldiers crossing the border by mistake were settled automatically. In an interview, Erdoğan proposed an exchange of the two Greek soldiers with the eight Turkish officers. Recent history indicates that the two countries occasionally stand on the brink of the abyss, but in the end do not fall into the trap of war. After 1999 especially, Greece and Turkey came unexpectedly close by means of what became known as “earthquake diplomacy”, when earthquakes struck both countries. At the same time, Greece made a significant change in its foreign policy, abandoning the use of its veto to obstruct Turkey’s aspirations to accede to the European Union. The 2016 agreement between Europe and Turkey about managing refugee flows has rendered the relations between the two NATO allies extremely important. The Turkish President has also stated that “no peace is as good as peace with Greece”. The two sides give the impression that they are playing with fire in the Aegean but without feeling any real risk, since they know that in the end they will retreat, exactly as they did in 1996. The most likely scenario is that Greece and Turkey will indeed remember the importance of good neighbourly relations at the last moment. However, we may have to wait for the end of the Turkish elections before things calm down. Otherwise, the two countries may once again reach a midnight crisis as in 1996. The difference though, is that in the early hours the US President no longer resolves problems, he only comments about them on Twitter. This is a factor that Greece and Turkey must take very seriously into account before they continue the needless escalation of tensions. In light of the delusional and treasonous policies of the militant hard-Left in Berlin and Brussels of allowing and inviting any person into Europe due to their erroneous interpretation on the laws regarding “refugees”, Erdogan is taking advantage of this by allowing the trafficking of these people into the Aegean Islands and into mainland Greece. His goal is to sufficiently swarm the Islands with these people so they become a significant demographic of the Island population. It is only a matter of time when the Soros backed militant hard-Left demands voting rights for these fakefugees, and once they have these voting rights, they will demand a referendum to allow the specific Island in question to secede from Greece and to be annexed by Turkey. So as far as Erdogan is concerned, why enter into “warfare” with Greece when they instead can practice “lawfare” with Greece; after all, both the EU and individual nations’ Parliaments, Judiciaries, academia, media, etc… have been infiltrated with traitors who are willing participants in self-destruction. Erdogan is merely there to witness the self-suicide of Europe; why risk the lives of Turkish soldiers. So basically, the military talk is mere tough-guy talk that will not materialize. There is no reason or a possibility for a Turkey Greece war. Majority of Greeks and Turks do not want war. Turkish and Greek people are friends. Turkey – Greece boarders have been defined in 1923 by Lausanne Treaty. Turkey respects the Lausanne Treaty and has no annexation plans on Greece land and islands. Greece should also respect the Lausanne Treaty and not try to annex small islands near Turkey’s mainland which belong to Turkey as per Lausanne Treaty. Fascist Greek politicians (Minister of Defense) should end Greece-Turkey war rheoteric and agitations.